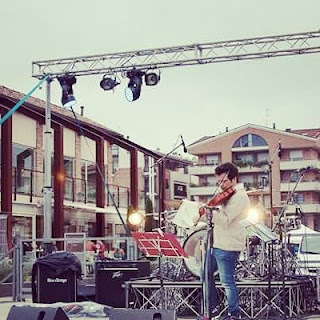 I am Matteo Lama and so far so normal, I work as a graphic designer and I mainly deal with advertising, I paint when I have time, I write some poems here and there and I like to compose music, the instruments I play and the most loved are the violin, the viola, and the guitar. When I compose I also use keyboards and various synths, I don't consider myself a virtuoso, I love to look for various colors and musical tones, I prefer the warm and enveloping sensations of music and above all engaging, then the music is complex as a whole and cannot be evaluated with a first superficial listening. I had a somewhat complex musical training process: when I was about 10 I picked up the first violin, then I studied as a private student, then I moved on to the viola studio attending the conservatory, then I gave up and studied the guitar. .but I don't want to bore you, so much everyone has his own path, the important thing is to love what you do!